Your customer data is the key to your success. This data provides you with information about the behaviour and buying patterns of your customers. However, the amount of the customer data you have collected alone will not bring you success. A much more important factor is how complete, up to date and accurate your directories are. Are you aware that every year more than eight million people move home in Germany, more than 45 thousand streets are renamed and around 2,000 place names are changed? The same applies for the B2B sector: company names, responsibilities and job titles change almost continuously. Well-maintained customer directories are a vital prerequisite for communicating effectively with your customers! You save on postage and advertising costs. Make sure that your data is always up to date. Keep your data inventories up to date! Don’t leave your address data to chance; make it the responsibility of one of our data management experts. They know exactly how your data should be managed, maintained, stored and secured in order for your promotional measures to be successful and to cut your costs. Excluding undeliverable addresses and duplicates will help you to make considerable savings in costs. Professional data management means you will not lose customers because they have moved or as a result of incorrect addressing. We check their creditworthiness to ensure that only customers who are capable of paying receive your promotional messages. We prepare your promotional mailshots to optimise postage costs so that you receive the biggest possible reductions. By adding additional data sets such as telephone information or industry codes to your company directories, you obtain a more precise profile and can make even more targeted approaches to your customers. Errors in capturing addresses can quickly result in ladies being turned into gentlemen and gentlemen into ladies. We ensure that you create a favourable, professional impression by addressing your customers correctly. If you entrust your valuable customer data to us, you can be sure that it will be protected with the highest security standards, because we work to the quality and performance standards of the “Deutsche Dialogmarketingverband e. V.” and are certified by them on an annual basis. We offer an impressive modular system – make use of just those services which you actually need. 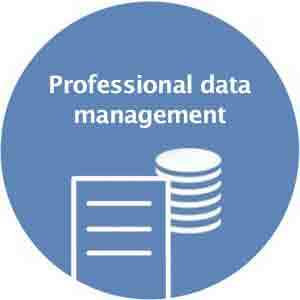 Contact our customer advisers from the Data Management team today. They will be happy to help you and to provide you with a quote tailored precisely to your needs.